My youngest daughter recently has developed a deep love for horses. She wants horse everything. She’s taking horseback riding lessons at a local stable and recently asked for her room to be redecorated into a horse theme. That got me googling. 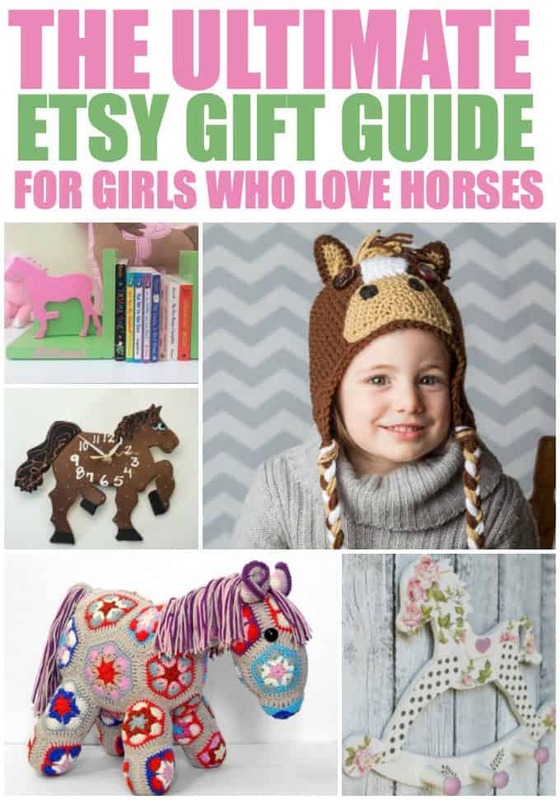 Where can I find a gift guide for girls who love horses? As it turned out, I couldn’t find one in my searching so I decided to make my own. I figure I can’t be the only one out there with a horse loving daughter on her holiday shopping list. I went on Etsy to create my gift guide because I know I can count on finding a unique, one-of-a-kind gift. I love supporting crafters and have shopped on Etsy lots in the past. I ended up finding the cutest horse themed items perfect for my daughter’s room and a few things she can wear too. 1. 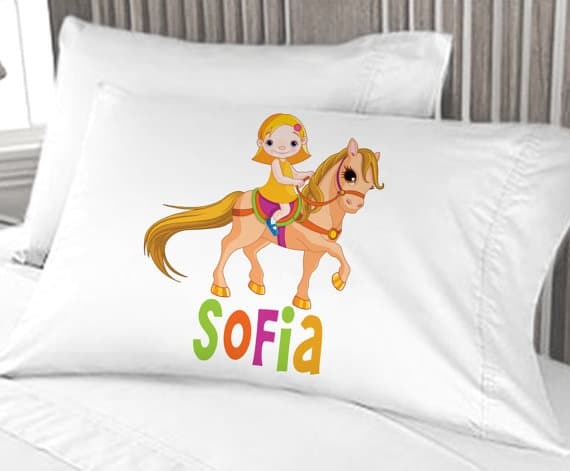 Personalized Horseback Riding Pillowcase for girls: Little girls will love having their own unique pillow made just for them. Change the hair and skin to match your little one’s appearance. 2. 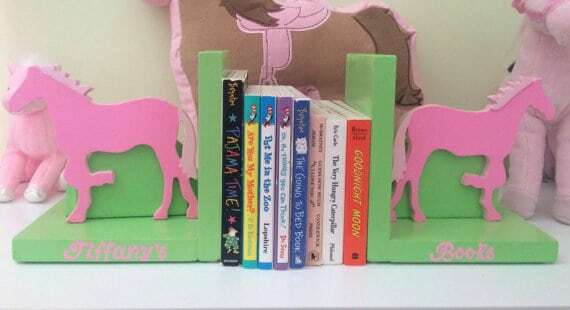 Pink Horses Kids Bookends: A cute personalized accent for a little girl’s room to showcase her favourite books. 3. Custom Name with Horses Kids Removable Wall Sticker Decor: A beautiful wall graphic featuring your child’s name and galloping horses. 4. 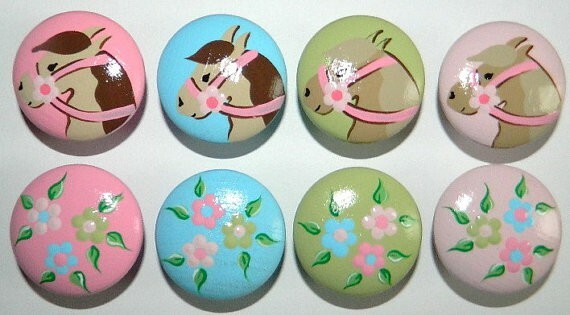 Horse Drawer Knobs: Add some horse magic to an existing dresser with these pretty knobs. 5. 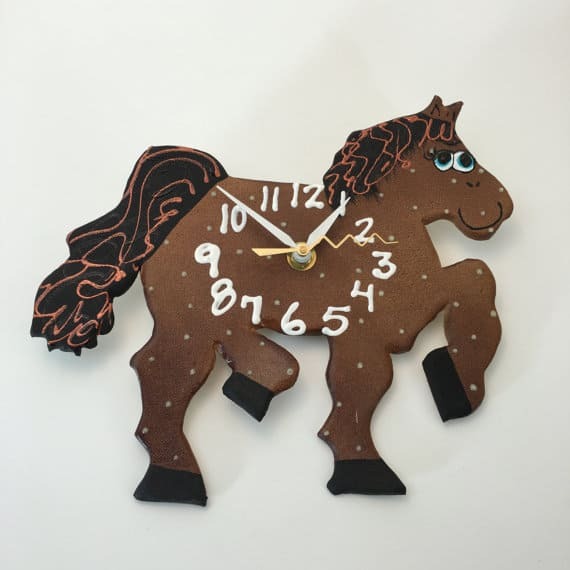 Horse Children’s Clock: Teach kids to tell time with this beautiful handmade ceramics horse clock. 6. 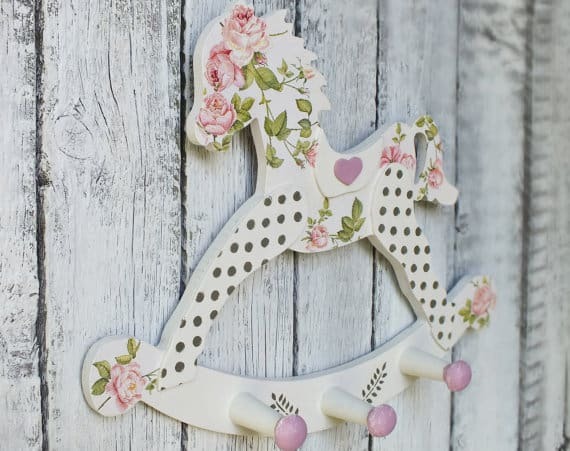 Horse Wall Rack: Practical and gorgeous, this handmade beauty adds a nice touch to a horse themed girl’s room. 7. 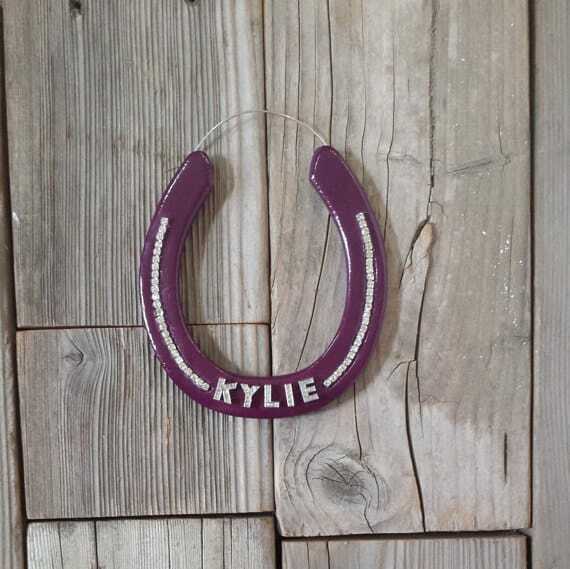 Personalized Horseshoe: A sweet room accent perfect for a horse loving girl. 8. 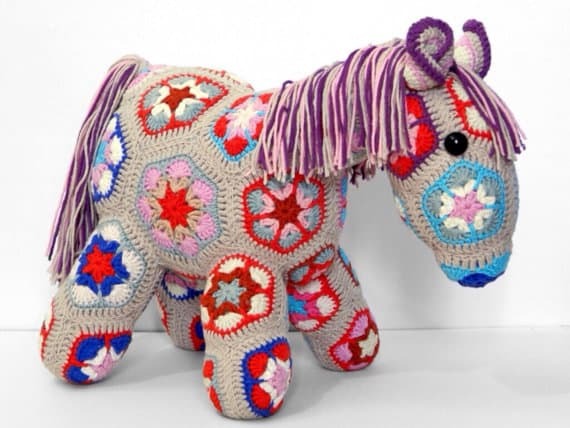 Crochet Stuffed Toy Pony: What horse loving girl wouldn’t want this precious hand-crocheted pony? Super cute. 9. 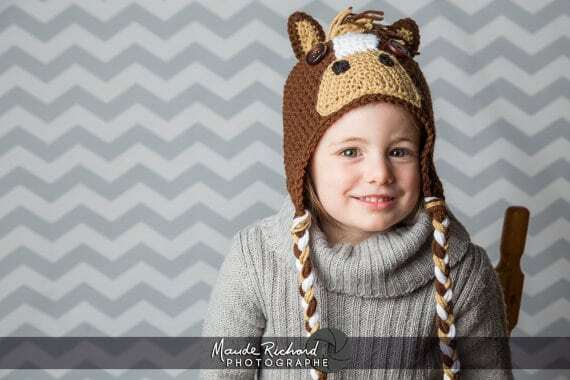 Knitted Horse Cap: Every little girl needs her own adorable horse hat! 10. 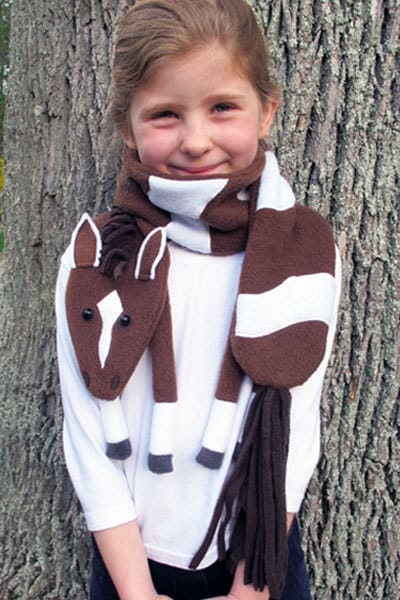 Horse Scarf: Keep your little warm cozy and warm wrapped up in this cute fleece horse scarf. For more holiday gift ideas, check out the Etsy Editor’s Picks page. The Etsy Kids Holiday Guide has a ton of cute stuff! You might also like these horse lovers subscription boxes. Are you shopping for a horse fan this holiday season? These are all super adorable ideas but my favorite has to be the Crochet Stuffed Toy Pony. Lots of awesome gifts, love everything!! There are so many wonderful things to be found on etsy! Cute ideas! Love the crocheted horse hat! I like the Horse Wall Rack.